I heard about the controversy regarding Earth 2 #20 long before I got a chance to read it. The problem stemmed from the revelation that The Red Arrow - a hero who had gone unnamed and largely undefined apart from a snarky personality - was named Connor Hawke. For those who don't know, Connor Hawke was the name of Oliver Queen's illegitimate son and the second Green Arrow in the pre-New 52 DC Universe. He was also of mixed-heritage, his mother being half-African/half-Korean. Unfortunately, many artists and colorists did not bother to portray this and Connor was frequently depicted as a light-skinned, clean-shaven clone of his father despite being meant to be quite different physically and in terms of personality. Some are bothered that Connor Hawke would be revived looking more like Roy Harper - with white skin and red hair - than as he appeared before. I understand that and agree with it to a point. However, I'm reluctant to label this as a case of "white-washing" given the nature of the Earth 2 series and the personal track record of the creator involved. The world of Earth 2 has taken many characters and combined them, creating new characters that may seem familiar while offering new twists on classic formula. For instance, multiple versions of The Atom have been condensed into one character with the name of the original Atom (Al Pratt) and the size-changing powers of his successor (Al Rothstein). Taking Oliver Queen's two sons and combining them in a similar fashion honors both. Would I have preferred a visibly mixed-race Connor Hawke? I think so, yes. 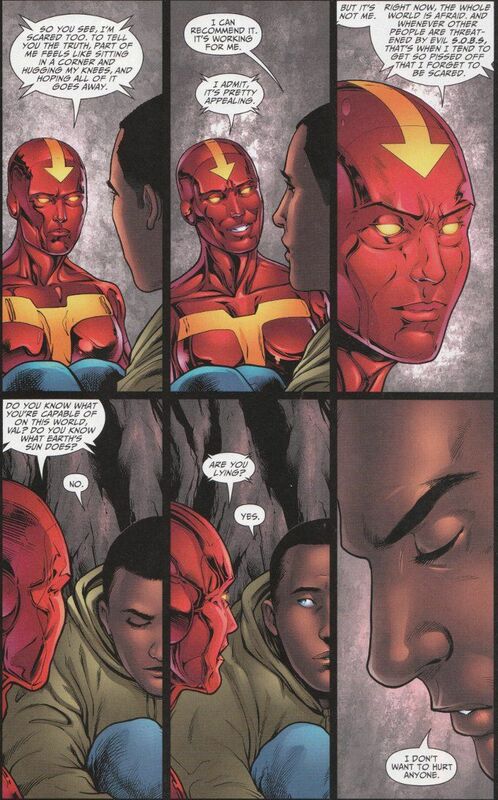 But I'm reluctant to scream racism at a series that has done so much to give us a more diverse DC Universe. 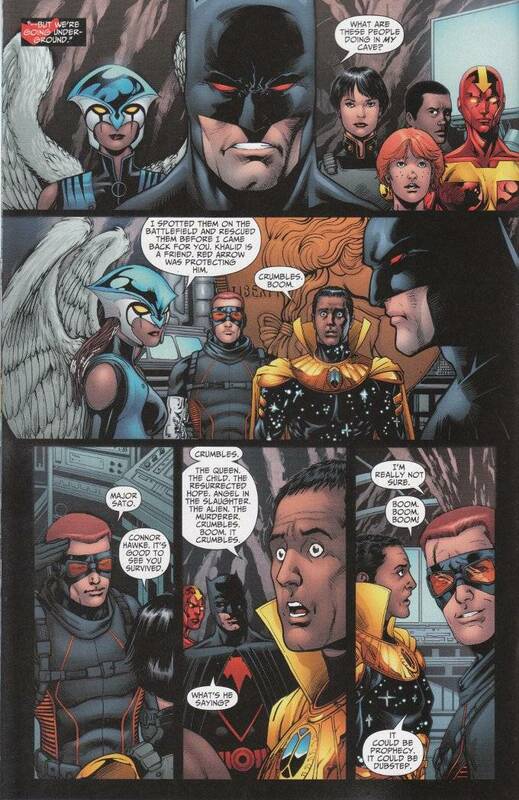 So far, this series has given us a Hispanic Hawkgirl, an Arabian Doctor Fate, an Indian World Army commander, a gay Green Lantern, a senior-citizen Batman and - if the end of this issue is any indication - a black Superman. To complain about one character going from mixed to Caucasian in the face of all that seems short-sighted to me, particularly when we know so little about the character and his background so far. And it's ludicrous to call Tom Taylor a racist when the independent comic series he's created and is currently developing into an animated series is based around the adventures of a mixed-race family of super-scientists. Ignoring all the controversy, this is a damn fine issue. Taylor is a great writer of dialogue and he has a great grasp on the classic characters of the DC Universe. The best moments in this book involve Lois Lane - now inhabiting a robot body - attempting to comfort a young Kryptonian named Val who is agoraphobic thanks to his having spent virtually his entire life either trapped inside his Kryptonian birthing matrix or locked inside a government facility. These scenes offer a glimpse at a Lois Lane long absent from the most recent Superman books - the Lois Lane with an iron will and nerves of steel who was as strong as Superman in all the ways that matter. The artwork by Barry Kitson is a match for Taylor's script. Kitson is a skillful artist and inker and a tremendous visual storyteller, who gives a certain sense of emotional power to alll of the scenes in this issue where people are just talking. Robson Rocha and Oclair Albert are less skilled in depicting the issue's lone action scenes, in which the villain Brutale orders all the holy sites on Earth destroyed in the name of Darkseid, but the work here is competent if not as fine as Kitson's.